Corrosion of metal is a long-standing historical and global problem in a wide range of industries, and the oil and gas industry is no exception. Pipeline operators are faced with many questions about the presence, location, and severity of corrosion in their oil and natural gas pipeline systems. In addition, many challenges arise in estimating a realistic rate at which corrosion may be growing. An overly conservative corrosion growth rate can lead to inspecting the pipeline more frequently than needed, additional required and costly excavations, as well as inaccurate modeling and forecasting within a risk program. One way to gain an understanding of pipeline condition and degradation rates is by performing an in”‘line inspection (ILI) of a pipeline. A variety of ILI technologies are available; however, the magnetic flux leakage (MFL) or ultrasonic wall measurement (UTWM) inspection technologies are most typically used for assessing corrosion of metal pipelines. An ILI survey will report the axial and circumferential location of detected corrosion anomalies along the pipeline, as well as the severity of the anomaly in the form of depth, length, and width measurements. 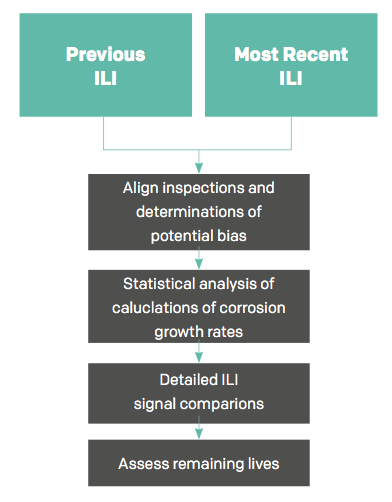 If two inspections are available for a pipeline, a corrosion growth rate can be calculated based on the change in depth of the same individual corrosion anomaly divided by the time between the two inspections. Well written paper and a good discussion.... Log in or register to read the rest of this comment.